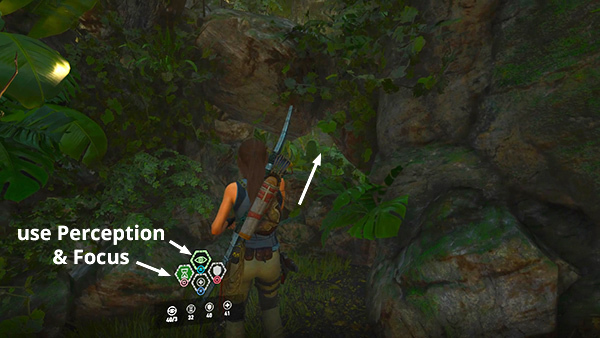 This strategy assumes you have the Scales of the Serpent skill, which allows you to use Focus herbs. If you don't, or if you enter the jaguar's area from the east side, there are additional tips below. Around the right side of the bell tower is a ledge overlooking the EMPRESS JAGUAR'S HUNTING GROUND. 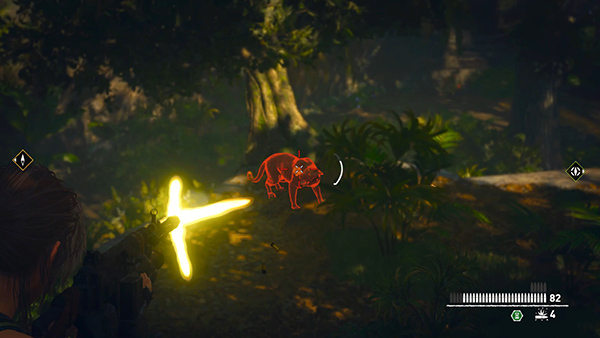 There's an alternate entrance on the far side of this shady clearing, but if you're fearful of the big cat, you can probably kill her safely from above. 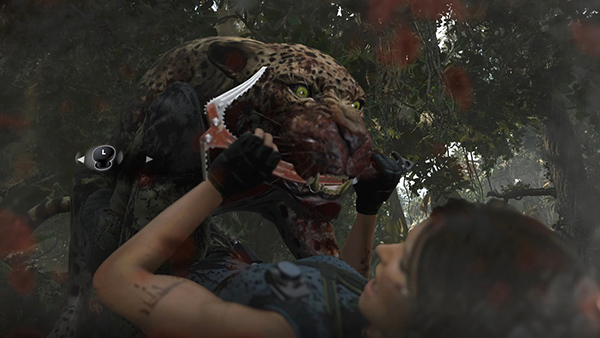 Fighting the empress jaguar is optional, but you will need to defeat or run past her to get to the FIRST CHALLENGE TOMB ENTRANCE. This strategy should make it much easier. Move to the edge, watch, and wait. 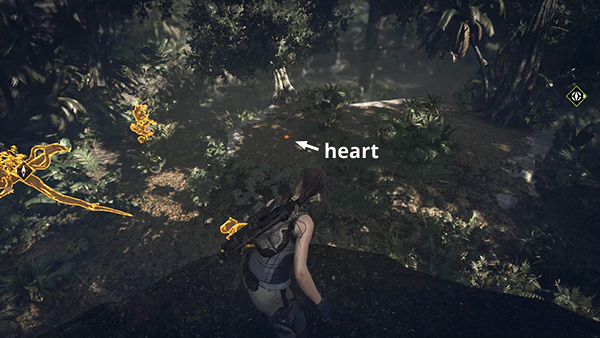 Soon Lara will go into a defensive crouch as she senses the predator below. 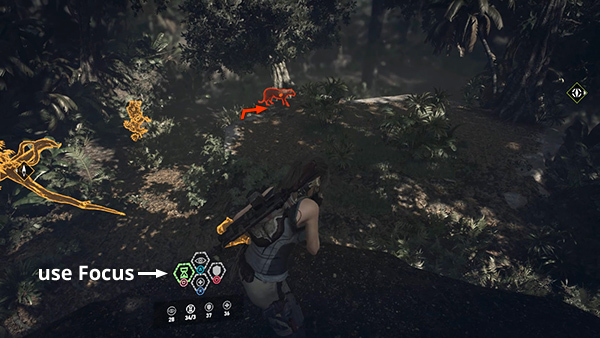 Survival Instinct should allow you to spot her more easily. Watch as she stalks off to the right, then back to the left. If you have the skill Illipa's Sight, her heart will glow so you can even track her when she moves behind trees and rocks. This isn't necessary but it helps. Wait until she climbs up onto the plateau in the middle of the clearing. At this point, she'll be close enough to target. Use a dose of Focus herbs. Now draw your rifle, aim, zoom in, and fire a few quick bursts. 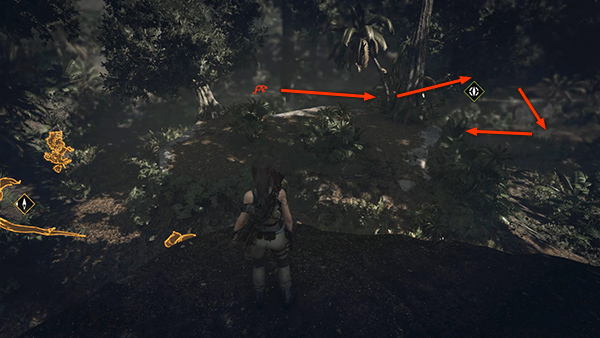 The time-slowing effects of the Focus mixture should allow you to kill her easily before she's able to run away and hide. 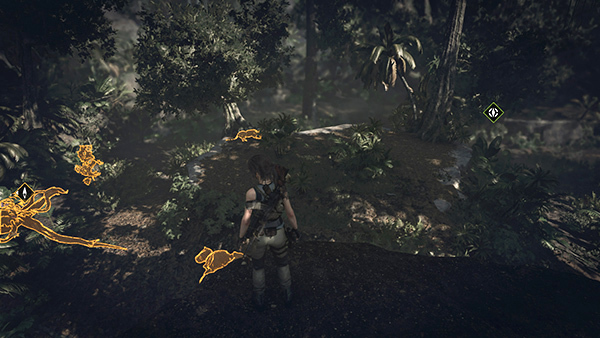 Now you can drop down, claim the exotic hides and gather various resources scattered around the arena. 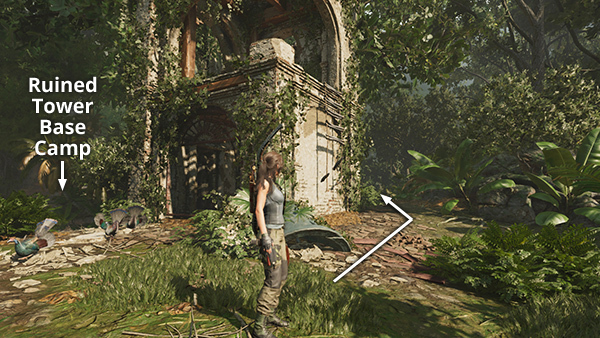 Lara may crouch as though enemies were present, but this is a bug; you're safe. 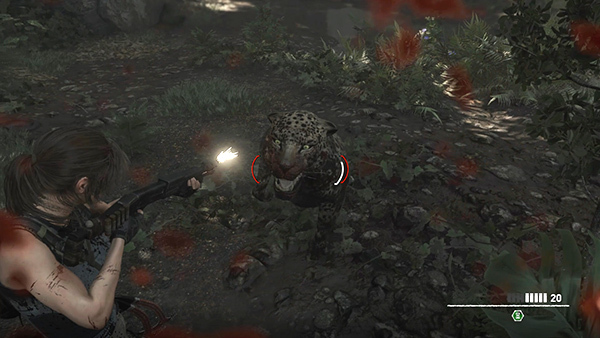 Once the jaguar is dead, deer and rabbits should also emerge, so you can hunt them as well if you like. 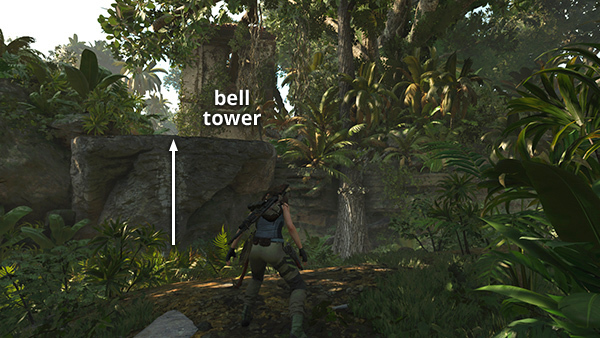 At this point you could go straight for the CHALLENGE TOMB, but there are other collectibles near the RUINED BELL TOWER, so in order to save backtracking, climb out of the jaguar area on the northwest side. 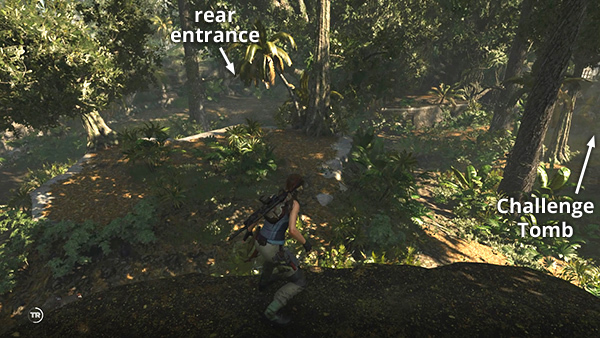 If you enter the jaguar area through the small opening on the east side, things can still go pretty quickly if you're prepared. 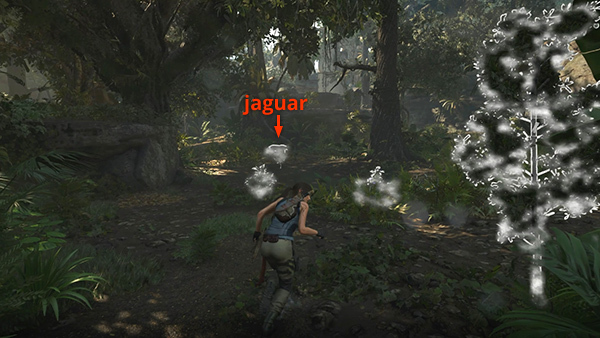 Then, as soon as you enter, you should be able to see the jaguar outlined in white directly ahead. Immediately aim with your rifle. As you do, the time-slowing effects of the Focus herbs kick in, and you should have plenty of time to kill the cat before she runs off. If you don't have Focus herbs (or the Scales of the Serpent skill that allows you to use them), the Perception herbs will still help. With the jaguar outlined in white, it won't be able to sneak up on you. 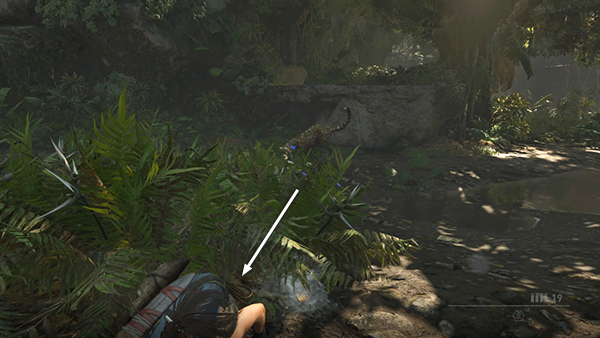 If she charges and pins Lara to the ground, a short QTE will ensue. Wiggle the left stick back and forth or alternate pressing A/D on the keyboard to hold it off with your axe. 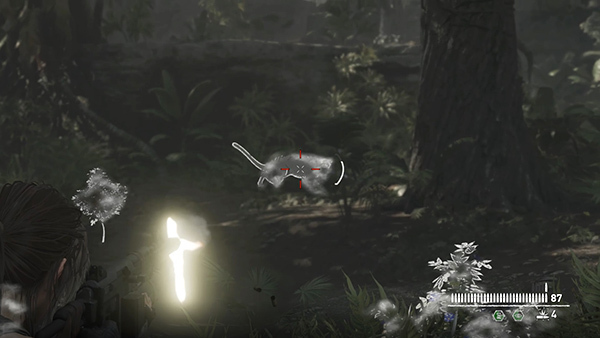 Then a circular icon appears with a symbol for one of the controls (it may be Interact or Melee so pay attention). The outer ring will gradually contract. 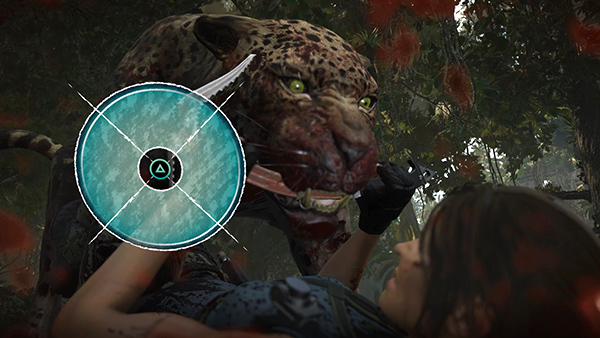 Press the button indicated before the ring reaches the center in order to knock the jaguar aside. If you have ammo for the shotgun, this would be a good time to use it. Two shots at close range should do the trick. 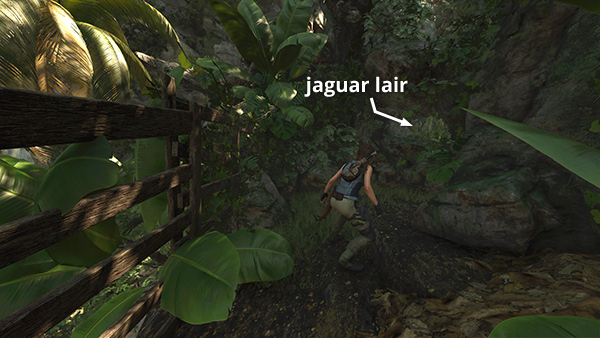 Otherwise, keep running/dodging and shooting as you've done during the earlier jaguar fights. When she falls, collect the empress jaguar hide and gather various other resources from around the arena.